Whitney Portal is the launching pad for some pretty amazing trips. Most people who climb Mount Whitney or hike the John Muir trail will start or end their hike at this trailhead, and in the majority of cases, permits can be difficult to acquire. Fortunately, the first few miles of the Mount Whitney trail do not require a permit to dayhike, which allows anyone to sample this classic trail without dealing with the frustrating permitting system. The reward at the end of the hike is Lone Pine Lake, a small sandy lake surrounded by the imposing granite walls of the Whitney canyon. The trail immediately heads up the northern slope, providing a view up the canyon towards the hike’s eventual goal. Lone Pine Lake rests on the left side of the saddle. Although the trail moves through a forest, there are frequently large openings that provide views of the surrounding landscape. Something that is striking about this canyon is how narrow it is in proportion to the sheer size of the walls on both sides. It feels a bit like Yosemite Valley or Kings Canyon in that respect. Since the hike is mostly sun exposed, it can be pretty hot in the summer. Fortunately, there are a few streams you will cross that can replenish your water and allow your dog to cool off if you are hiking with one. Like most Eastern Sierra hikes, looking to the east usually results in a nice view of Owens Valley and the White Mountains. It is hard to look anywhere without seeing something worthy of a photograph. After 2 and a quarter miles, you’ll reach a trail junction, and a hundred yards down the side trail you’ll be greeted with Lone Pine Lake. Lone Pine Lake is not very scenic by Sierra standards, but it’s still a nice place to cool your feet off or take a swim. There is no inlet or outlet river feeding water through the lake, so it appears to be heat up in the sun more than most Sierra lakes. There are trails that circle the lake which makes it easy to see from all angles, or escape the crowds if you are there on a busy day. On the northern side of the lake, some granite benches provide a nice break spot with a view of the lower part of the canyon you just hiked up. Heading down, you may notice one of the mysteries of the Mount Whitney trail. 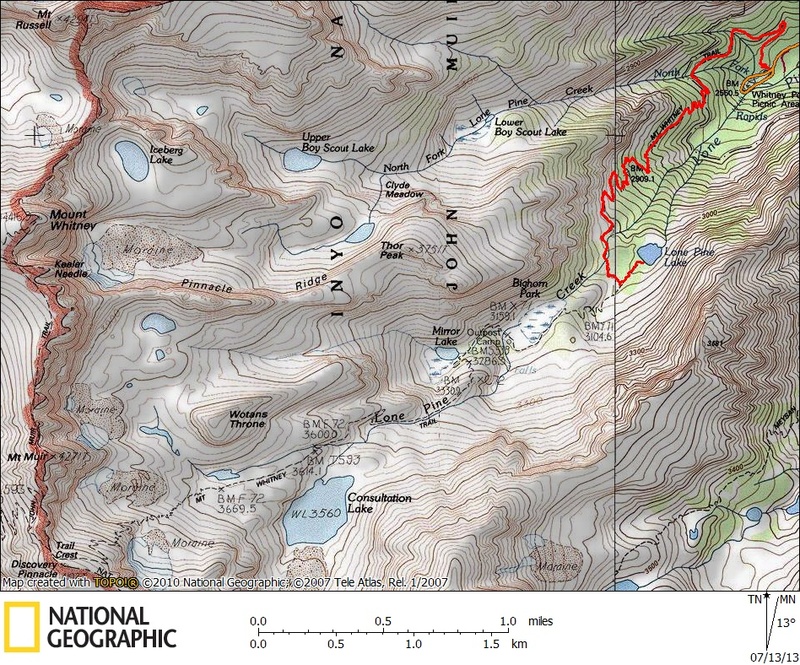 How can a trail that ascends 1700 feet in a little over 2 miles be so flat? The switchbacks seem to stretch on for days. You can practically reach out and shake hands with the people up or downhill from you on some of them. This felt particularly brutal at the end of last year’s Mount Whitney dayhike. For a short hike like this one though, the meandering trail feels just right. Why rush to escape such splendor? Awesome thank you so much…heading there last week of August! Yeah, if you can drag or carry your old man! This is great. Very interesting. I’m looking at moving to California after I graduate from college in May (2014), so it’s great to find fun things to do with a dog. Awesome pictures! This is a great hike. I ended up staying over night at Lone Pine Lake on the way up to Mt. Whitney a couple of years ago. You description of the canyon and the high granite walls is spot on! Thanks for sharing. Wonderful set; gotta check out this one next year! Swimming in Lone Pine Lake was awesome. It was easily 90 and the water seemed to be in the mid 70’s by afternoon. We spent the day there it was so terrific. Get went, swim around and then lie on trhe rocks and get hot – do it all over again! Great spot not requiring much work to get there. Enjoy!!! Any idea how deep Lone Pine Lake is? No idea. Probably no more than a hundred feet.